Xena the Warrior Princess is a cult TV series that ran for far too short a time (1994-2000). It was one of the hit syndicated action/adventure shows of that time, and a spinoff from Hercules: the Legendary Journeys. Occasionally goofy and campy, Xena chronicles the saga of a reformed warlord and raider with incredible martial skills and a temper. The heroine and her spunky sidekick live in a mish-mash world loosely based on Classical stories. It’s something of a kitchen sink setting. Xena was notable for starring a charismatic action heroine, which was vanishingly rare back then (Buffy was still in the future). Further, it had a primarily female cast, also something rare in a fantasy/adventure show (Charmed was also still in the future). *Further* the kickass heroine and her clever sidekick were obviously an item, with but the flimsiest deniability. This was unprecedented representation for bisexual women. Other Aliases: The Warrior Princess. Marital Status: In a relationship with Gabrielle. Known Relatives: Gabrielle (Soul mate), Cyrene (mother, deceased by end of series), Toris (older brother), Lyceus (younger brother, deceased), Atrius (father, deceased), Solan (son, deceased), Eve (daughter), there was a mention of a third brother but Xena may have been lying as this was in her “villain” phase or he may have died in infancy. Group Affiliation: Former leader of her own army. Base Of Operations: Primarily Greece though she traveled a lot. Height: 5’10” Weight: 160 lbs. Strictly speaking, Xena has no powers as everything she does is explained as skills and training in the “Comic Book Peak Human” tradition. In game terms though, she can jump superhuman distances. For instance, she once jumped dozens of yards to a ship well off-shore. She also heals faster than humanly possible, although this is generally explained as martial arts-style mind over matter. Xena’s wealth is in “dinars”. There is no explanation for where she gets her money after her turn to heroism. Perhaps it’s leftovers from her mercenary days. Xena’s time would be more or less the 11th century B.C.E.. I say “more or less” because the world of Xena and Hercules is a hodgepodge of time periods with the Age of Mythical Greece (circa 11th century B.C.) mixing with the Age of Classical Greece and various other time periods, past and future. 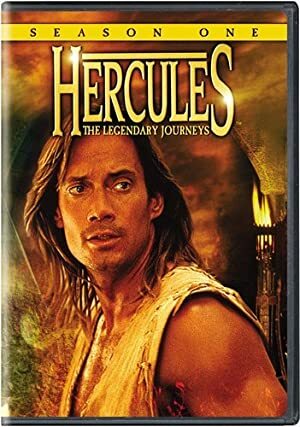 Hercules exists in the same time period as Homer who, in the real world, wrote The Iliad and The Odyssey some thousand or so years after the time period that the Hercules myths are set in. Plato, Aristotle, Socrates, Euripides , Beowulf, Gilgamesh, Merlin and Julius Caesar exist in the same generation. Mythical Greece, the height of Classical Greece and the height of the Roman Empire all exist at once. 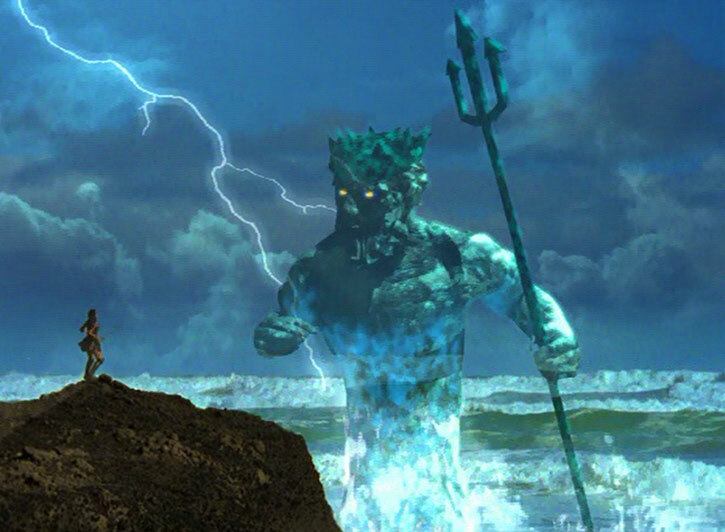 Xena’s father, Atrius, was a worshiper of Ares. One night, when Xena was 7, he came home drunk, saying that he intended to sacrifice her to Ares. He began sharpening a knife. When Cyrene, her mother, saw he was serious, she grabbed an axe. In the fight that followed, she killed him. Cyrene told Xena that Atrius had gone off to war again. When he never came back, Xena assumed he had either died in war or just chose to never return. Xena began her life as a warlord (or war-lady) when the Warlord Corteze and his army attacked her village when she was a teenager. They used the place as a supply depot, taking whatever they wanted. She convinced most of the villagers to unite and train to become warriors to resist him. That included her younger brother, Lyceus. Some, such as her older brother, Toris, refused. These retreated into the hills. Xena did chase Corteze away, but Lyceus was killed in the fighting. That alone probably drove her over the edge. Then she tried to convince all of the surrounding villages to train and join her army to provide a buffer against Corteze and other warlords. When they refused, she conquered them. Many of the men joined her army. After that, there was no going back and she started to like the lifestyle. Her army kept growing and traveling. Thus, she became something she never set out to be. Xena soon took to the seas to continue looting and building a power base from which to protect her village. On one raid, she captured a young woman named M’lila. She was an Egyptian who had been captured and enslaved by the Gaels. Somewhere along the way, she had learned superior martial arts skills. These included the art of pressure points. While she was not on the level of what Xena would eventually achieve, she was Xena’s teacher. M’lila raised Xena’s combat abilities vastly higher than they had been before. They had already been extraordinary, but now they were superhuman. On the same raid, Xena captured a Roman nobleman named Julius Caesar. She ransomed him back to the Romans. But they fell in love and formed an alliance before that happened. After he returned to his own ship, it came about and she thought he was returning to her. But his men opened fire, capturing Xena and her crew. His love had been a pretense to get her to drop her guard. Returning to the nearest beach, Caesar had her and all of her men crucified. But M’lila, who had escaped during the battle, returned and saved her. She took Xena to her friend, a healer named Nicklio. He set Xena’s broken legs. Seeing that she was missing, Roman soldiers tracked her and broke into Nicklio’s cabin. He was knocked out. M’lila sacrificed herself, diving in front of a crossbow bolt to save Xena. Despite the agony of broken legs, the enraged Xena killed the soldiers and declared that a new Xena was born that night, one who desired only to kill her enemies. 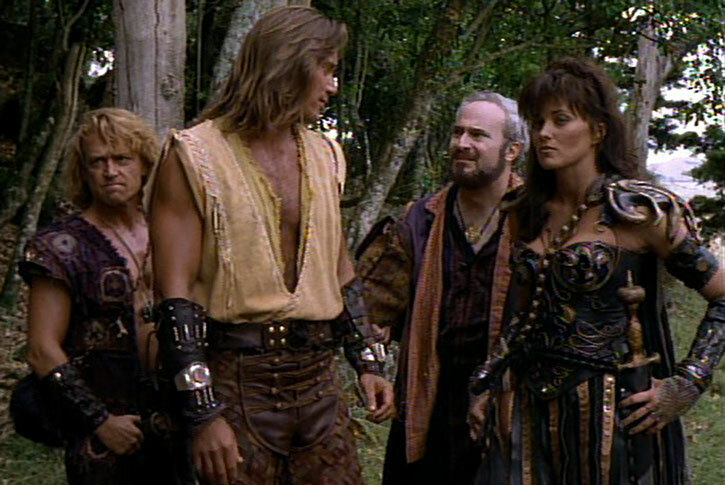 Journeying to “the East”, Xena allied with a warlord named Borias. He was a wise leader who sought to form alliances and he wanted to keep his bargains. Xena, on the other hand, just wanted to kill and be driven by her instincts. Time after time, she destroyed alliances he might have formed by her inability to control herself. When she tried to kill a potential ally, Lao Ma, he finally threw her out. She then kidnapped Ming Tien, the child of one of Borias’s potential allies. She held him for ransom, forcing Borias to her terms. But once the boy was safe, Borias turned her over to the angry father. The man decided to hunt her for sport though she was still recovering from broken legs at the time. She was helped by Lao Ma, who hid her out. Lao Ma commanded great powers that she harnessed by casting out hatred and the need for power. She tried to impart this understanding to Xena. Xena tried to understand but she was not ready for it. However, she very much loved Lao Ma, so far as she was capable of love at that time. The two shared a deep romance for a while. When Lao Ma attempted an alliance between herself, Borias and the Warlord Ming, Xena killed Ming in a fit of rage. He would have also killed the little boy, Ming Tien, who was secretly Lao Ma’s son. To save him, Lao Ma overpowered Xena and Borias and cast them out of her land. This hurt her badly because she truly did love Xena and saw the potential in her. Xena was also hurt that Lao Ma could not accept her as she was. Or, rather, could accept her limits but could not allow Xena to do as she pleased. They traveled near one of the Amazon tribes. Xena met a shamaness named Alti who had been expelled from the Amazons. Alti knew that Xena was pregnant with Borias’s child, even though it was not showing yet. She began luring Xena into her world of dark magic with promises of great power. Alti also had an apprentice, a young woman named Anokin. She and Xena took to each other right away. When Anokin was killed a short time later, Borias could not understand Xena’s sorrow over the loss of a young woman she barely knew. Especially as Xena never seemed to care about anyone. He seemingly missed the obvious implication that Xena and the other young woman had become lovers and buried feelings had awoken in Xena. She was hurt even worse when Alti taught her how to travel to the spirit realm so she could see Anokin again only to have Anokin reject her, saying she had poisoned her soul, most likely due to the dark path Xena was treading. Borias then allied with a tribe of Amazons led by a Queen Cyane. “Cyane” was the name of the first leader of that tribe of Amazons and was often traditionally taken by subsequent leaders. Xena pretended to befriend her and learned still more fighting techniques. She eventually betrayed and killed her and all the Amazon leaders. Alti then trapped their spirits in a desolate wasteland known as the Land of the Dead. In this way they could not cross over into Eternity, the true afterlife. When Xena’s son was being born, Borias intended to take him away. He did not want him to be raised to become the type of person Xena was – or be in danger. But Borias was murdered when he entered the camp. He was stabbed in the back by Dagnine, a lieutenant of Xena’s. Finally realizing what she had become as she looked into Borias’s dying eyes, Xena took her infant son to her enemy, the centaur Kaleipus. She asked him to raise him. She wanted him raised by the very sort of people she had always opposed. This child, Solan, was indeed raised by the centaurs. He never realized Xena was his mother. It was then that Xena encountered Hercules for the first time. At this time, she was leading an army with the intention of conquering Greece. She knew her greatest obstacle was Hercules. Xena arranged to “accidentally” meet Iolaus. She recruited him with a story about how she was a freedom fighter opposing a ruthless warlord named Patraechus who was, in fact, an elderly farmer. Her real goal was to turn Iolaus against Hercules and set him up to be killed. Then, as Hercules stood in shock, she and her men would attack and kill him. To accomplish this goal, she pretended to fall in love with Iolaus. From there, Xena manipulated him and Hercules into a situation where they would fight to the death, even ruthlessly sacrificing one of her own men and slaying another to bring the situation about. At the moment of truth, neither Hercules or Iolaus could bring themselves to strike a killing blow. They reconciled. 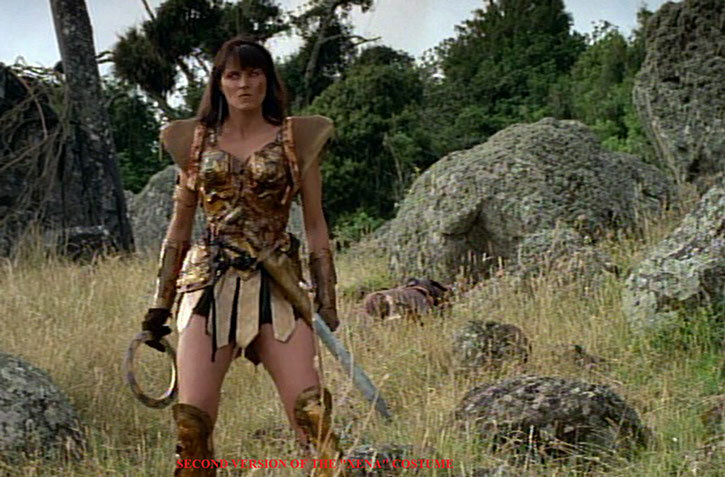 They defeated Xena’s army but she escaped during the battle, without attempting to confront Hercules in personal combat. Xena had a policy of allowing villages to surrender and serve her army. If they refused, she attacked and killed them. However, she always spared women, children, the elderly and non-combatants. This did not sit well with her second-in-command, Darfus, who reveled in butchery. While she was gone on a scouting mission, he led an attack on a village, slaughtering everyone except one baby that he overlooked. Xena returned and saved the baby. She then tried to relieve him of command. But he had subverted most of the men in his favor. She had grown so far away from the others that she was not realistic about the fact that most of them were just murderers or mercenaries. They forced her to run a gauntlet in which the men lined up to either side allowing a narrow “hallway” between them. She had to get through it while being attacked by all of them. Though badly hurt, she made it through. Thus, Darfus was forced to let her go as even these men would not violate the sacred rules of the Gauntlet. Hercules was after her, believing she was responsible for the slaughter. However his friend, Salmoneus, who had been in her camp, swore Darfus was the true threat. Having rapidly healed, Xena confronted Hercules, believing she could get back her army’s loyalty if she killed him. This was one of those fights where there are those who will say Hercules clearly won and those who will say Xena did. They fought and Xena knocked him down. She had the luck that he struck the back of his head on a rock and was stunned – but she had to strike with tremendous force for that to happen. One of his friends then attacked her. She easily knocked him out but it gave Hercules the chance to recover and defeat her. But she clearly won first and he would not have been alive to win without the interference. Hercules refused to kill her and that was the biggest change of directions she ever made. Later, alternate reality versions of Xena hinged on the fact that she never met Hercules and was never changed by his showing her mercy. In those realities, she became even more of a ruthless monster who conquered the known world. But, inspired and changed by this event, she helped him defeat her army. She personally killed Darfus in combat. However, Darfus was brought back by Ares and given the giant demon dog, Gregus, in order to kill Hercules. Hercules, Xena, Iolaus and Salmoneus defeated him anyway. Xena and Iolaus reconciled while she and Hercules ended up falling in love. But they had to go their separate ways as she believed she had so much evil to make up for. Xena then tried to walk away from her past and from being a warrior. But she immediately saw how impossible that would be when she encountered villagers, including a brave young blonde girl, threatened with slavery by marauders. She saved them and went on soon enough to her home village. Her mother and her people rejected her because of her past and would not believe that an army was marching on them. Meanwhile, the young blonde woman, Gabrielle, snuck away from home. or rather she tried to, and ended up having to explain to her sister that she was going to try joining up with Xena and seeing the world. Gabrielle showed up just in time to save Xena from being stoned by her own people. She then helped prevent outside interference when Xena fought the Warlord Draco, who was an old flame of Xena’s, to get him to spare the village. Xena defeated him and was reunited with her mother. Afterwards, Xena allowed Gabrielle to travel with her, at least for the moment. Xena then embarked upon a number of adventures where she opposed various warlords and faced the guilt from her past. She was reunited with an old flame named Marcus. When they had met wasn’t clear, but it seems to have been near the end of Xena’s villainous career. Inspired by her, he changed his ways and sacrificed himself to save an innocent. She met Ares, the God of War, face to face, for the first time, outmaneuvering him as he plotted to turn her back to her old ways. She was reunited with Hercules and it was established that, at that point in time, they were very much in love with each other. Each sought to take the lead in a suicide mission to free the Titan Prometheus so mankind would not lose his gifts of making fire and the ability to heal. Xena tried to avert a war between a tribe of Amazons and a group of centaurs led by Tildus. Tildus’ and Xena’s armies ha donce fought to a standstill. Selected by Gabrielle as her champion, she fought and defeated the Queen of the Amazon tribe, Melosa. 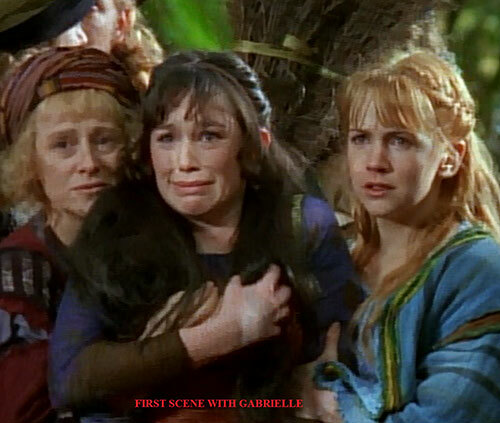 Gabrielle became Queen of the tribe though she returned leadership to Melosa after things settled down. Xena averted the war, exposing the warlord who was manipulating things. She met the first of several “identical twins” when she met her exact lookalike, Princess Diana, and saved her from an assassination plot. Her former lover, Marcus, met her again when the Helmet of Hades was stolen and evil took over the Fields of Elysium. Though himself condemned to Tartarus, he helped her restore things to their proper place. Thus did Marcus earn a place in Paradise. At that point, Xena didn’t know yet about her father’s Atrius death. But when she met him, she nevertheless rejected any possibility that he was her father. That was because of the huge resentment built up over his leaving when she was a child and never coming back. Nevertheless, a bond began to form between them. He maneuvered her into fighting a warlord and gaining control of an army. When he was murdered by villagers who he had previously wronged, she went momentarily mad with grief. Xena was going to have her newfound army slaughter the entire village until Gabrielle brought her to her senses. “Atrius” then revealed that he was Ares in disguise. This had all been a plan to get Xena back. When she said she would rather die than return to him, he almost killed her. But Ares could not bring himself to do it. While protecting a village from marauders, Xena was struck from hiding by a dart filled with poison. Within hours, she started to become incapacitated, the worst of it striking during a battle with a warlord. She managed to get away but he took credit for her defeat. She had to put herself into a trance to heal. Gabrielle thought she was dead. Thus, she did her best to fight the warlord and take her body back to be buried by that of her brother, Lyceus. Xena healed enough to come out of the trance just in time to save Gabrielle and Salmoneus, who had been willing to sacrifice himself to save a village. She defeated the warlord. However, the mystery of her hidden attacker remained. A short time later, the mysterious assailant revealed herself. Her name was Callisto. Back when she was a warlord, Xena had killed almost everyone in Callisto’s village including her parents. It had been an accident, as a fire had gone out of control. Callisto’s intention was to slaughter as many villages as possible while using Xena’s name. This would destroy the reputation she was beginning to develop for having changed her ways before killing her. The would-be warrior, Joxer, was also introduced. When Gabrielle was captured by Callisto, however, he refused to kill her. Xena and Callisto battled atop ladders high above the ground as Gabrielle hung above them. Xena managed to rescue Gabrielle and defeat Callisto. As Callisto fell, Xena caught her though Callisto wanted to die. Callisto still burned with the need for revenge. Xena still had to deal once again with the guilt for what she had done in her past. Xena was reunited with her older brother, Toris. He had tracked down the Warlord Corteze, who was responsible for the death of their younger brother, Lyceus. In the process of finally getting to the warlord and defeating him, Toris had to face that his anger towards Xena for “corrupting” their brother was really anger at himself. Deep down, he admitted he knew that had everyone followed his plan and retreated into the hills, they would have been tracked down and picked off at Corteze’s leisure. Though Xena’s choice to form an army went wrong, it was the only approach that could work. Finally, they were reconciled. Toris decided to head home after facing his moment of truth and turning Corteze over for trial rather than killing him in cold blood. Xena traveled back to the centaur village where her son, Solan, had been raised by Kaleipus. Now nearly a teenager, he did not know she was his mother. She killed Dagnine, once a lieutenant in her army, after he got an elixir that turned him into a “super-centaur”. In the fight, he revealed that he had killed Borias by stabbing him in the back. But Xena felt she had to move on and not reveal to Solan that she was his mother. Callisto escaped from prison and came after Xena. But when she heard that Gabrielle had gotten married, she veered off with the intent of killing Gabrielle. Instead, she ended up killing her new husband, Perdicas. Worried that Gabrielle would sacrifice everything she stood for to get revenge, Xena confronted Callisto again. Crashing in a wild chariot race, they both ended up in quicksand. Because Xena had a whip and her chakram, she was able to pull herself out. She could have saved Callisto but let her die. Plagued by guilt over allowing Callisto to die, Xena was having nightmares. She would seemingly wake up, only to realize she was still sleeping and in the nightmare. 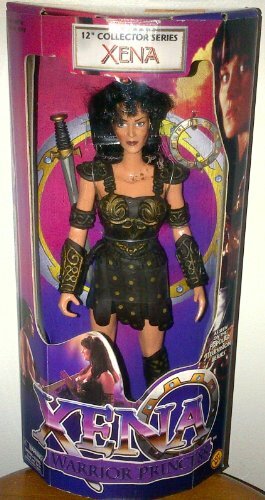 Although trapped in Tartarus, Callisto had forged a plan with Ares to escape and get revenge on Xena. 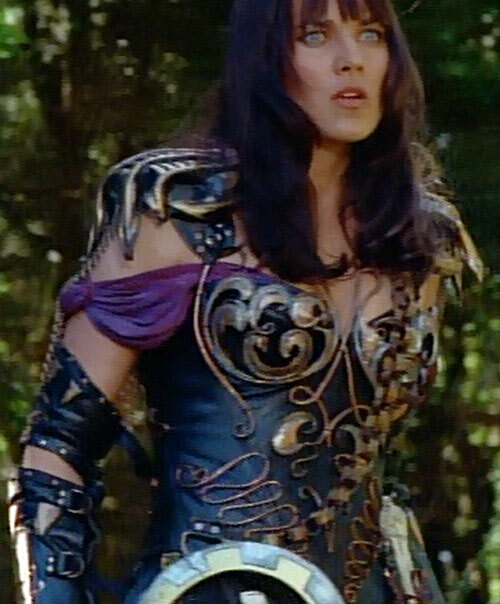 In Xena’s dream, she and Callisto confronted each other in Tartarus with Ares there. They manipulated Xena into admitting that allowing Callisto to die when she could have saved her, was a shallow pretense. It was still murder. With that admission, Ares, was able to switch the minds of Callisto and Xena into each other’s bodies. While Xena was trapped in Tartarus in Callisto’s body, Callisto in Xena’s body went on a rampage. She killed her old number one henchman and took back her army. She captured Xena’s village including her mother and prepared to burn them just as her own village had burned. Meanwhile, Xena convinced Hades that she was really Xena in Callisto’s body. Thus, she was granted one day and night to defeat Callisto. Ares warned Callisto that Xena was free and after her. He also told her to just avoid Xena for 24 hours. But Callisto was obsessed with personally destroying Xena and making her watch her mother and village burn. The two of them finally fought a pitched but equal battle. As Xena (in Callisto’s body) started fading back to Tartarus, she executed her real plan. She stabbed Callisto with a poison dart as Callisto had previously done to her. But this poison put Callisto to sleep. Xena was then able to draw Callisto’s mind into Tartarus with her. There, she made Callisto confront her own mother and all the people she had killed. Although Callisto insisted that everything she had done was Xena’s fault, she felt the guilt. That was enough to trap her in Tartarus. Xena returned to Earth but, for some reason, she returned in Callisto’s body. Gabrielle had to deal with the fact that when she looked at her best friend, she saw the person who had killed her husband. Subsequently, Sisyphus escaped from Tartarus, stealing Ares’ sword in the process. Each god had a special object which allowed them to maintain their godhood [at least according to this episode]. Xena helped Ares get the sword back and regain his godhood. He promised her that he would return her proper body to her if she succeeded and he did. Xena regained her own body. This profile is continued in part #2.